I joined NonaKnits Peaceful Palms KnitAlong. Check out the patterns and updates. I don’t remember why I was thumbing through my copy of “Weekend Knitting” by Melanie Falick. I had it with me on a Friday evening, sitting in front of Chili’s, waiting for a table for dinner. My husband and two boys were with me, and they are used to mom bringing her knitting along. I stopped on the page with patterns to make gloves – both fingerless and whole. 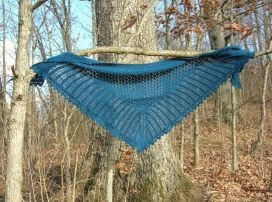 The pattern calls for DK weight yarn; I had just finished my Highland Triangle Shawl using Merino Style from KnitPicks, and knew I had almost two skeins left of this DK weight wool. However, on the way home from dinner that evening, I stopped and bought the dpn that I would need to knit the gloves. 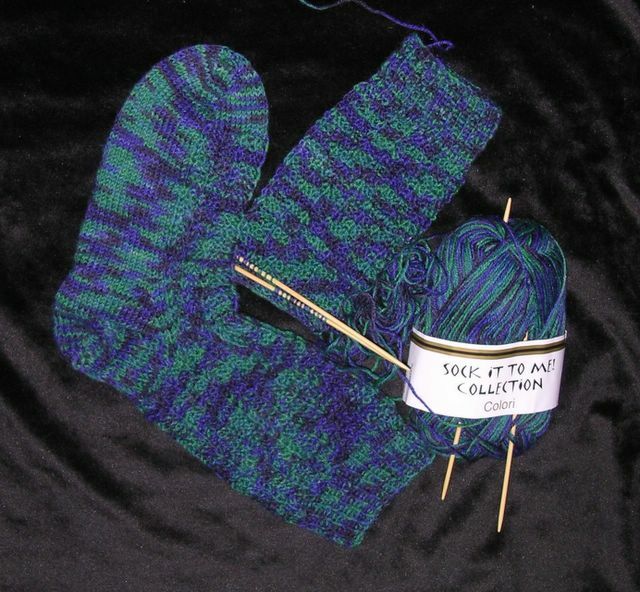 That evening, I started the pattern, using my very soft, storm colored merino wool along with my hope that if I just followed the instructions, I could actually knit gloves. The next evening, I was dancing around the family room, holding up my half-finished glove, sing-songing, “I have a thumb. LOOK! A thumb.” Happily, my husband was suitably impressed. We all know that it isn’t. It’s just one stitch after the next. But – WOW – at the end of the project, I’ll have a pair of gloves. I will also have a huge pile of self-confidence to tackle the next, more difficult project. 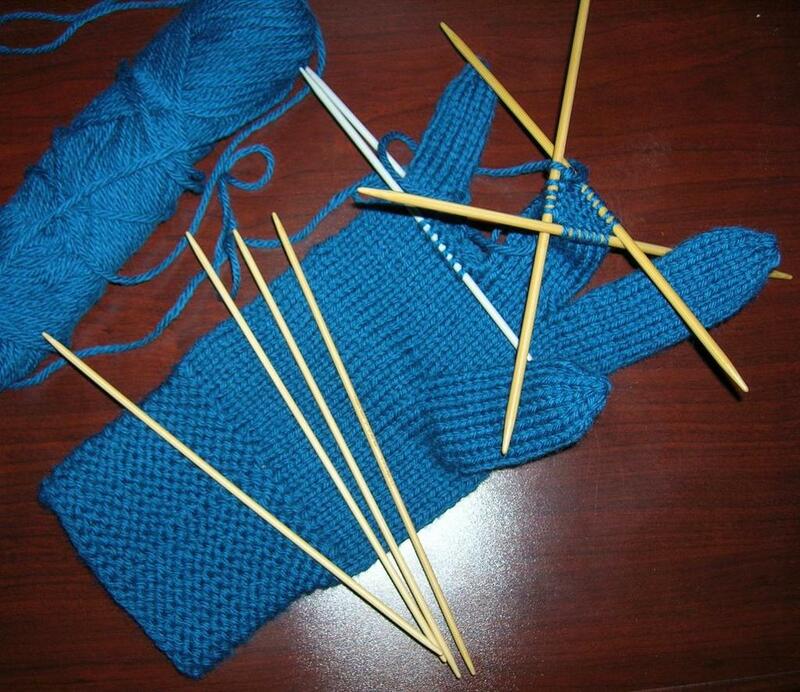 I am on my way to becoming a Knitter (with a capital K). Someday I’ll do a sweater – one stitch at a time. I just finished the book KnitLit the Third, and thought I would share my thoughts about it. The book is edited by Linda Roghaar and Molly Work and is subtitled, “We Spin More Yarns.” As can be divined from the title, this is the third book in a series of collections of yarn stories – stories written by knitters across the country (world) and compiled for our enjoyment. Before reading this book, I had read the other two editions, and very much enjoyed them. They are full of funny and heart-warming stories concerning our lives with knitting and yarn. I was looking forward to the third edition. After reading it, I must admit that this sequel is more poignant than funny; it has more stories concerning the role of knitting in the crises of our lives than in our mountaintop experiences. I felt that the balance of hilarious to tear-jerking stories was out of balance. This book has many more stories centering on death or illness than previous editions. I felt bombarded with deep-felt emotion with not much to relieve the stress. I don’t mean to say that all the entries should be funny, but I could have used more light stories to counteract the heaviness of the others. However, this book does have some gems. I love the story by Stephanie Pearl-McPhee (the Yarn Harlot concerning her experience in an airport without (gasp!) her knitting. (And if you would like to read another story about the Yarn Harlot in an airport, check out this blog entry about “The Weenie.” Hilarious) It was great to read Ann Shayne (of Mason-Dixon Knitting) tell the story of how Ann and Kay came to be blogging buddies and then co-authors. “Have a Mice Weekend” by Kay Flores was a hoot. The poem by Harry Kelley called “The Cardigan” reminded me of Dr. Suess, but was a great read. There were other stories that I won’t take the time to list that made the purchase of the book worth its price. In order to always know where I was in the pattern, I used an excel spread sheet with row numbers and the number of stitches in each row. I had the spread sheet laminated and then marked off each box as I completed a row instead of using a row counter. I used two spread sheets: middle section and edging. When doing the lace pattern, be aware that Row 1 and Row 2, as written in the directions, are rows 1 and 2 of the chart. When working the edging, be aware that there are always just two stitches between the center markers. The YO at the corner are on the outside of the markers. 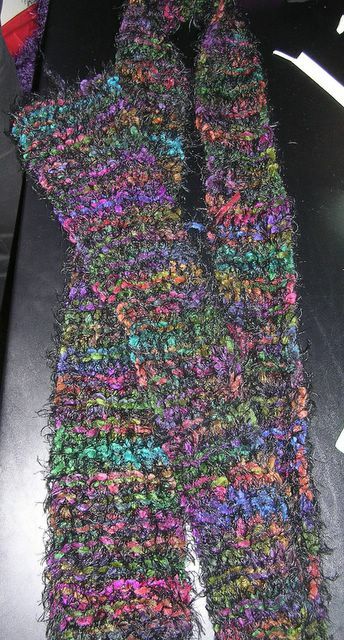 I used markers throughout the knitting of the center and edging. It takes some work to place the markers correctly so that the decreases do not displace the markers. Using markers really helped me to know if my stitch count was correct. I checked the stitch count often -- sometimes at the end of each row -- to try to catch mistakes early. 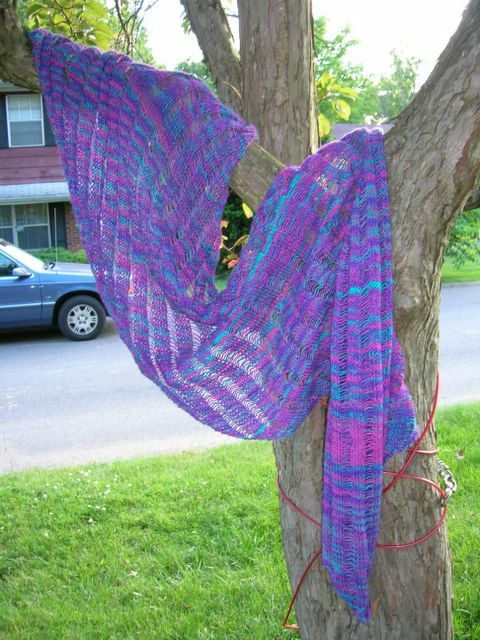 Be sure to follow directions and "bind off loosely" at the end so that the shawl will block nicely. 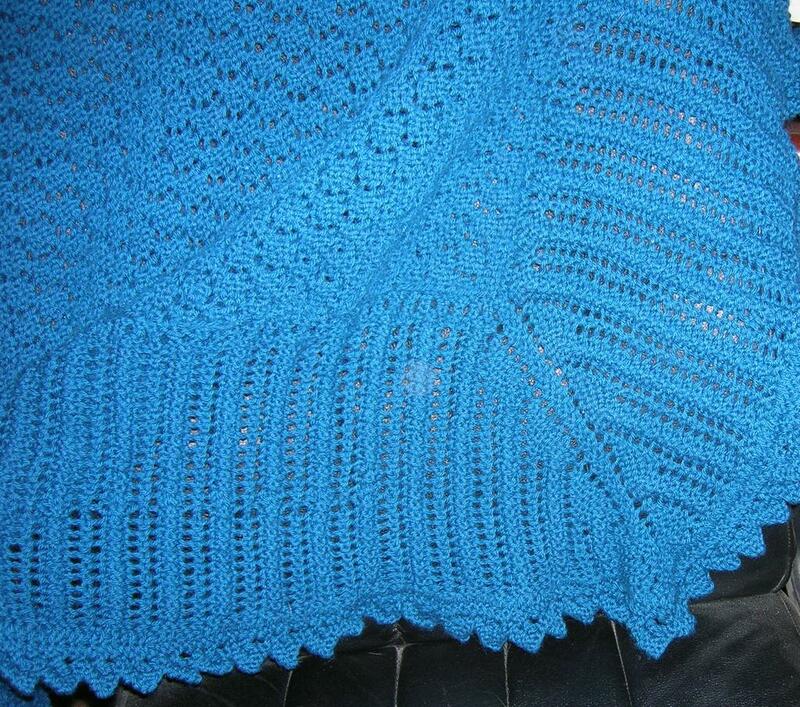 For all posts relating to this shawl, go to this link. (Post recovered and added from old SandpiperKnits website, which is now closed (due to Geocities stopping free web pages). We went to Lexington again this weekend, and I made a trip to the yarn store. I purchased Encore DK weight yarn in color 455 -- it's a mix of green and black -- 2 skiens. 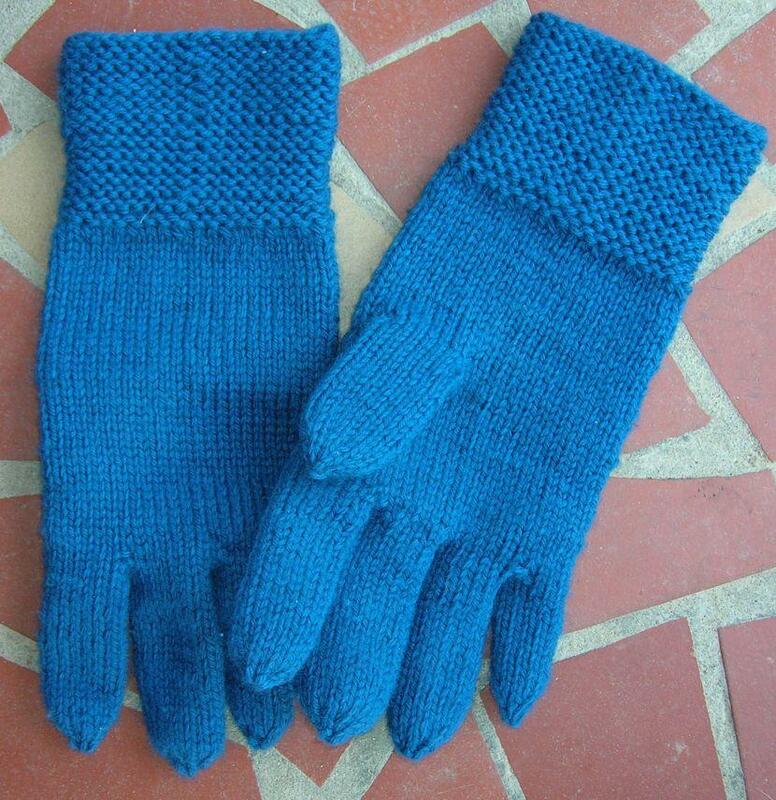 I thinking another pair of gloves for a Christmas gift. 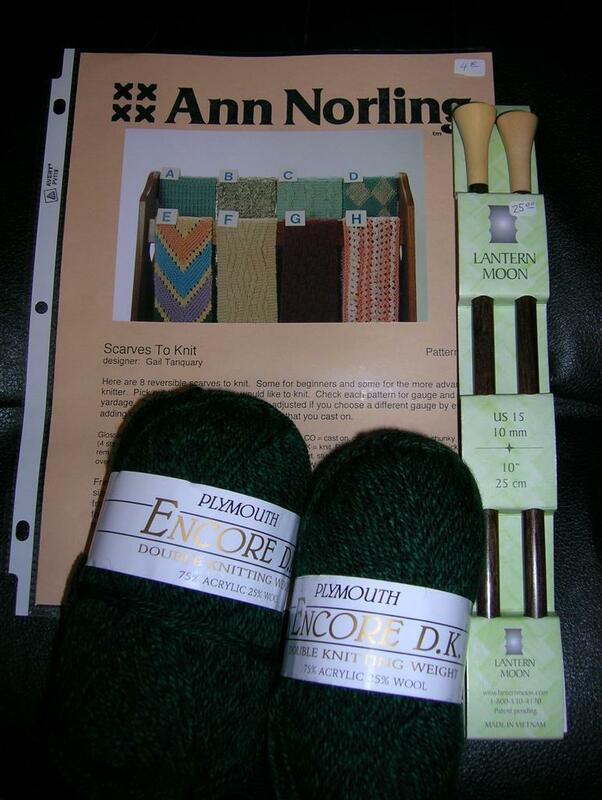 I also bought a pair of Lantern moon ebony needles, size 15 (a splurge) and an Anne Norling pattern for scarves. 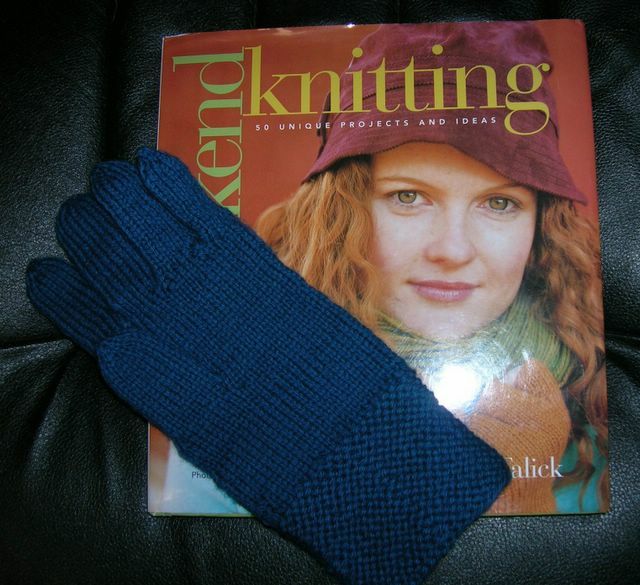 I had some leftover yarn from the Highland Triangle Shawl, and I saw a pattern for gloves in the book Weekend Knitting by Melanie Falick. I read the pattern, thought that it looked way to complicated for me, and decided to try it anyway. Look! A glove. I'm working on the other one now. 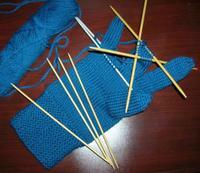 I feel like a real Knitter!